1. Is Redcraze Racing authorised to sell racehorse shares? Yes. Redcraze Racing Limited was approved as an Authorised Syndicator in March 2015 under the Bloodstock Exemption granted to New Zealand Thoroughbred Racing by the Securities Commission. 2. How does a syndicate work? The Syndicate is managed by the Manager, Redcraze Racing Limited on behalf of its Members. Members pay funds into the Syndicate's bank account and the Manager uses those funds to buy the Bloodstock and pay all costs incurred by the Syndicate. The Manager pays out any cash received from the winning stakes or from the sale of the Syndicate's Bloodstock or progeny to Members based on their shareholder percentage. 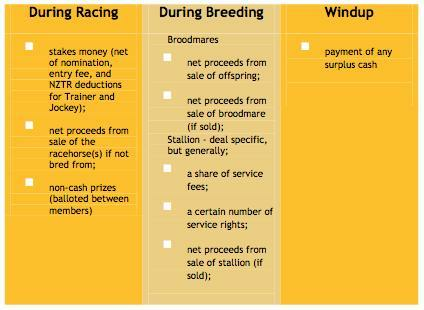 See attached diagram which outlines how the Syndicate works. 3. How are the horses selected? We use our internal experts and their breeding principles which have been developed over the last fifty years and utilises their own computerised pedigree analysis programme. Over 25 critical breeding principles are analysed. The results are compared to the large database of New Zealand and Australian Stakes winning gallopers. Our internal revolutionary 350+ programme is run to compare the index with the absolute best champions in New Zealand and Australia. Secondly we look at the physical conformation of the horse which must be excellent. Thirdly the temperament of the horse is also a major factor in our selection, without the right attitude the horse may not reach its full pedigree and physical conformation potential and can be difficult to train. We also take into account the sire fee, market conditions, breeding potential and possible residual value of the horse. This will determine the price that we believe is reasonable and provides our cap for bidding. Once they pass all these tests we may get a vet check on particular aspects of the horse’s physical conformation. An escopic (wind pipe) scope is also performed. Of course there is the auction....This is the most challenging part of all...securing our selections for the best possible price! 4. How are the trainers selected? The Manager uses a number of different trainers to achieve the best fit for each horse. We do not have one preferred trainer as each horse is uniquely different. Please note trainers do change from time to time. For the initial racing education we generally will use smaller boutique trainers to ensure our horses are handled and ridden by experienced operators. Once the horses have reached an appropriate level we transfer them to top racing stables to compete effectively at the highest level. 5. How are the races selected? The Manager works with the selected trainer and other suppliers to determine the best training and racing programme for the horse(s). In general, races are selected based on the horse(s) ability, fitness, location, field competition, to give the horse(s) every possible chance of performing at its peak for every race. 6. How do I buy shares in a horse syndicate? Once you have contacted us expressing an interest in purchasing shares in a horse syndicate, we will send you the NZTR approved disclosure statement for that horse(s) along with the syndicate agreement. Click here for the steps to follow. 7. What does it cost to own a share? The initial share price will vary depending on the horse(s) in the Syndicate offered. Full details of the cost to own a share and all the expenses which make up this initial share cost are listed in the Disclosure Statement and the Syndicate Agreement. As a general guide the initial share price includes the costs of the horse, current insurance policy, promoter’s costs and fee, Bloodstock selection and procurement fee, any race series entry fee (if applicable), Independent Valuation Fee, Independent Vet Examination Fee, GST, and an amount for working capital. Some horses would also include holding costs, breaking in and education depending on their age and stage of development. Please refer to the detailed expenses as listed in the Disclosure Statement and the Syndicate Agreement. 8. What does this entitle me to? Owners have control during and after its racing career. However the training, racing and breeding programme for your horse will be managed by professionals (the trainer and manager) with regular communication so you know exactly what is happening and why. 9. What are the ongoing costs? After the initial purchase each horse has ongoing expenses for training, spelling, transportation, trial and race day nominations, routine vet checks, farriers and administration. In New Zealand and Australia, it costs approximately NZD$40,000 and AUD$50,000 per annum respectively to race or breed one horse. Therefore for a 1% share in ONE horse the ongoing monthly cost to you would be approximately NZD$33 and AUD$42 per month respectively. You will pay a set automatic payment each month to cover these expenses. Please note that this excludes the cost of entering Listed and Group races which are the elite races in New Zealand and Australia. For these races the nomination and entry fees are generally much higher, but so is the prize money. If your horse is successful enough to enter these elite races your horse would typically have won sufficient prize money to cover nomination and entry fees. The monthly ongoing cost for a specific horse(s)/syndicate is detailed in the Disclosure Statement and Syndicate Agreement relevant to that horse(s)/syndicate. 10. Are there any risks involved? Yes. In the world of Thoroughbred racing there are no guarantees and risks you need to consider. While every possible resource is used to minimise risk and ensure your horse has a lengthy and successful career, it is still possible that your horse may get injured and require rehabilitation, break down and/or never race again. Another risk is your horse may not win a race. You need to carefully consider these risks before purchasing any shares in Thoroughbred horses. Further detail around the risks is included in the Disclosure Statement relevant to your horse(s). 11. If my horse wins races how is the Stake money paid out? Is any money retained? All stake money received (net of nomination and entry fees) is paid out to its owner’s bank account within 10 working days of the syndicate receiving the prize money. Amounts under NZD/AUD$5,000 in total will be carried forward and held in the Syndicate's Bank Account. 12. How are the financial records kept for my horse? How are they reported to me? Redcraze Racing uses high quality and reliable financial accounting systems. Each Syndicate will have its own dedicated bank account and detailed supporting documents for all transactions. This is available to you as a owner at any time. 13. As an owner, what correspondence do I receive regarding my horse? Owners will receive frequent email updates on the progress of their horse(s). These emails will include photos and videos of your horse to keep you informed on its progress and movements. The frequency of the communication will be at least monthly. Most mediums for communication are available; if you have a preference please let us know. You are more than welcome to contact us at any time. Please refer to our contact us page. 14. Who can I contact in regard to my horse? Each investor will have a dedicated contact person who will assist you with any queries that you may have regarding your horse or to organise a visit to see your horse. If you have any general enquiries our team will be more than happy to assist you. Please refer to our contact us page. 15. Am I able to sell my shares later on if required? Yes. If you find yourself in a situation where you would like to sell your shares, then the Redcraze team will use its best endeavours to assist you in selling your shares. However, the market for shares can be limited and as such it may take time. Further, depending on the success of the Bloodstock up to the time of sale, the price obtainable for the shares may be significantly less than what you paid for them. The Shares must firstly be offered at fair value to the existing Syndicate Members on a pro-rata basis before marketing to the public. 16. What should I expect during my racehorse ownership experience? Our team is dedicated to ensure that you have an enjoyable experience with us. If you go into ownership and plan on having a great time, meeting new people, going to the races, track work and have a desire to learn just what it takes to get your horse to the races, then you have started a winning ride. Remaining both positive and realistic about your horse’s ability and expectations will ensure you have an enjoyable experience with us. You may own a successful horse, or you may own a horse that is honest but just doesn’t win that race! In any event, racehorse ownership is highly addictive and fantastic entertainment. 17. How long is a horse's racing career? The length of a horse's racing career is horse specific. We generally are focused on proving horses on the track for breeding purposes, therefore the length is generally dictated by when they have gained sufficient breeding value. However, in general horses race as a late 2YO/early 3YO until they are approximately 5 or 6 years old. If they have won successful races then the mares will generally become a broodmare, and colts if successful on the race track will go onto a stud career. Those horses that are not suitable for a breeding career (i.e. geldings) can continue to race until it is considered not suitable to race anymore. 18. What happens when the horses racing career is over? The future of your horse after its racing career will be discussed amongst all owners. Most horses will have a residual value once their racing career is over. A filly usually goes to stud and can be valuable if they have had a solid racing career. If your colt was very successful on the racetrack and stayed a colt, then this can prove to be financially rewarding for owners of the colt. If the members decide to sell the horse, all proceeds of sale are distributed according to the share amount owned minus associated costs. 19. What happens if my horse doesn't race to expectations? If the Bloodstock doesn't perform to expectations the Manager will evaluate whether the Bloodstock should be retained for breeding or sold and provide a recommendation to the Syndicate Members for consideration. Members will vote in favour or against the recommendation. The decision will be binding on all Members if approved by a majority of at least 51%. Each member will receive one vote for each share held.